I normally don't eat a large breakfast, unless it is the weekend, and that is a completely different story. That usually looks like, a large brunch followed up by an early dinner. But enough of that, back to this breakfast. Some mornings I just need more. More of something filling. More of something sweet. Basically, dessert for breakfast. We can do that right, we are adults. Let's eat dessert for breakfast! 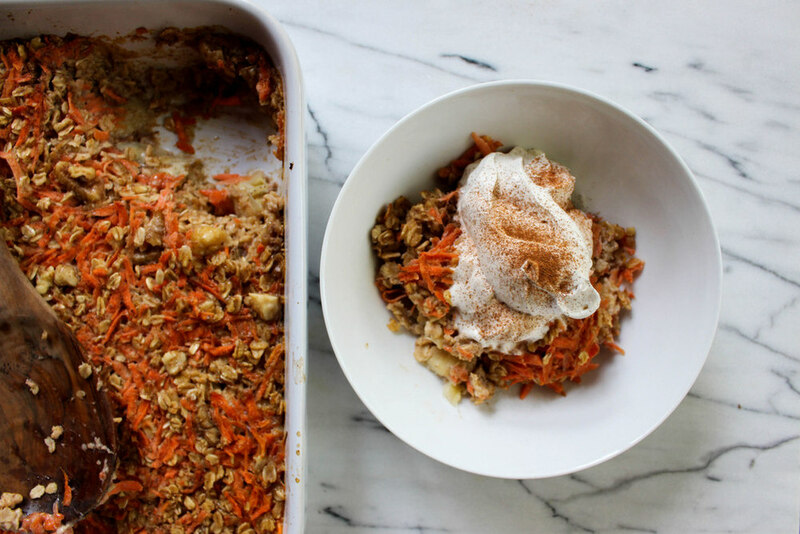 Carrot cake oatmeal filled with maple syrup, oats, carrots, bananas, walnuts and butter! Then, top with coconut whip, lots and lots of coconut whip. Add cinnamon and even some nutmeg, why not, this is dessert for breakfast, remember! Preheat the oven to 375 degrees and grease the inside of a 8-inch baking dish. In a large bowl, combine the oats, 3/4 cup walnuts, baking powder, cinnamon and salt. In a medium bowl, whisk together maple syrup, milk, egg, cooled butter, vanilla and shredded carrots. Pour wet mixture into oat mixture and combine. Spread a single layer of bananas across the bottom of the dish. Pour oat mixture over the bananas, pressing down on the oats and carrots with the back of the spoon, making sure they are covered by the liquid. Top with remaining walnuts. Bake for 35-40 minutes, until golden. Let cool for a few minutes while you make the coconut whip. Open the can of coconut milk and scoop out the solids into a mixing bowl. Using a hand mixer, blend the solids for 15 seconds on high. Add the powdered sugar and combine for another 10 seconds. Add the vanilla and blend on high for 1 minute or until light and fluffy. Top individual bowls with coconut whipped cream and a pinch of cinnamon.